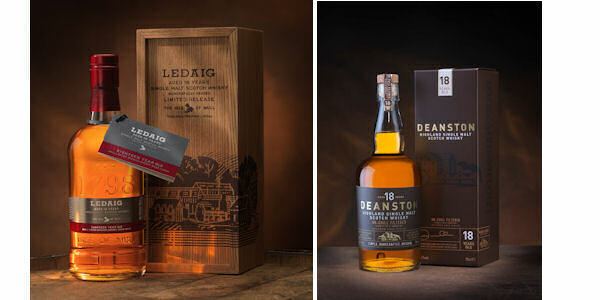 Burn Stewart Distillers has today announced the introduction of two new expressions – Deanston 18 Year Old and Ledaig 18 Year Old – both permanent additions to the range for each of the brands. Both additions have been crafted by Master Blender, Ian MacMillan, using traditional methods. Like all of the malts in the Burn Stewart portfolio, Deanston 18 YO and Ledaig 18YO are unchill-filtered, ensuring that more of the whisky’s natural aroma, flavour and texture remain in the bottle, delivering a deeper taste. Alison Gibb, Global Marketing Manager for Burn Stewart Malts, said: “It’s an exciting time in the Scotch whisky market. The new Deanston and Ledaig expressions demonstrate our continued commitment to grow the Burn Stewart malts portfolio and to offer our consumers more choice. Deanston 18YO began its journey in hogshead casks before being finished in first fill Kentucky bourbon casks, specially selected by Master Blender, Ian MacMillan. The casks were then returned to the vaulted warehouse at Deanston Distillery, the former cotton mill which was transformed in 1966 and has been producing a handcrafted, natural colour Highland single malt whisky ever since. The liquid slept here undisturbed within metre-thick stone walls, which helped to create the perfect conditions to ensure a smooth, even maturation year round. The resulting whisky showcases Deanston’s signature profile of sweet, honeyed fruit with a deep, rich finish and is distinguished by its aromatic and balanced notes of American oak and hints of tobacco and nutmeg. Ian MacMillan, said: “Like every malt we produce at Deanston, we’re proud to say that the 18 Year Old is deeply rooted in the history and tradition of the distillery. From the barley grown in the local fields, to the water sourced from the River Teith, only the best Scottish ingredients are used to create this unique single malt. The story of handcrafted Ledaig 18YO begins on the Isle of Mull at the Tobermory Distillery, the only distillery on the mystic island and amongst the oldest commercial distilleries in Scotland. Since its establishment in 1798, it has had a rich past, passing from one owner to the next, resulting in periods of long, sleepy spells. In 1996, Ian MacMillan started distilling Ledaig for the first time since the distillery re-opened after its final quiet period. Taking inspiration from the traditional style of single malts Scotch whisky that would have originally been crafted on the Isle of Mull, he created Ledaig 18 Year Old. The result is a wonderfully smoky island single malt Scotch whisky which balances sweet and floral aromas with the richness and warmth of sea salt and smoke. Ian MacMillan said: “Ledaig 18 Year Old is the result of nearly two decades of careful maturation and meticulous craftsmanship. Deanston 18YO and Ledaig 18YO are available in the UK and across select international territories including Europe, North America and Asia.